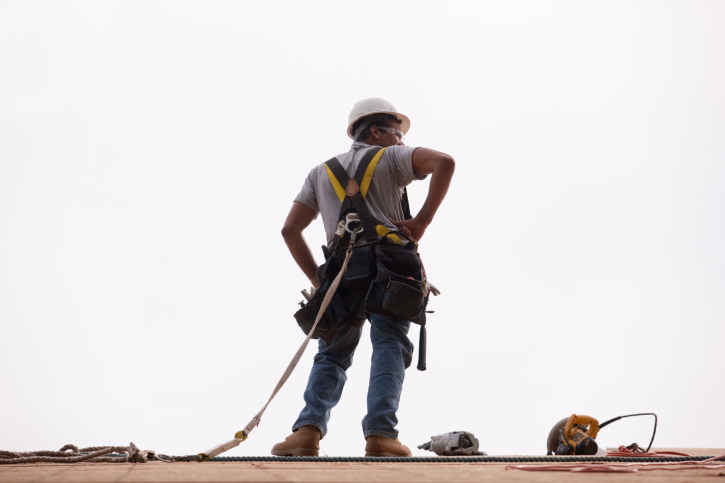 There are four major categories of fall protection equipment, and being familiar with all of them can seriously benefit every construction pro. Fall Arrest Systems– A fall arrest system is required if any risk exists in which a worker may fall from an elevated position. As a general rule, the fall arrest system should be used anytime a working height of six feet or more is reached. Working height is the distance from the walking/working surface to a grade or lower level. A fall arrest system will only come into service should a fall occur. A full-body harness with a shock-absorbing lanyard or a retractable lifeline is the only product recommended. A full-body harness distributes the forces throughout the body, and the shock-absorbing lanyard decreases the total fall arresting forces. Positioning Systems– This system holds the worker in place while keeping his/her hands free to work. Whenever the worker leans back, the system is activated. However, the personal positioning system is not specifically designed for fall arrest purposes. These can be body belts (single or double D-ring) that are designed to restrain a person in a hazardous work position and to reduce the possibility of falls. Suspension Systems– This equipment lowers and supports the worker while allowing a hands-free work environment, and is widely used in window washing and painting industries. The suspension system components are not designed to arrest a free fall. A backup fall arrest system should be used in conjunction with the suspension system. To learn more about PPE and other construction safety topics check out www.licensetobuild.com or www.certifiedtraininginstitute.com. Both are trusted sources for builders, contractors, architects, and anyone in the construction trades to get a license or complete their continuing education.